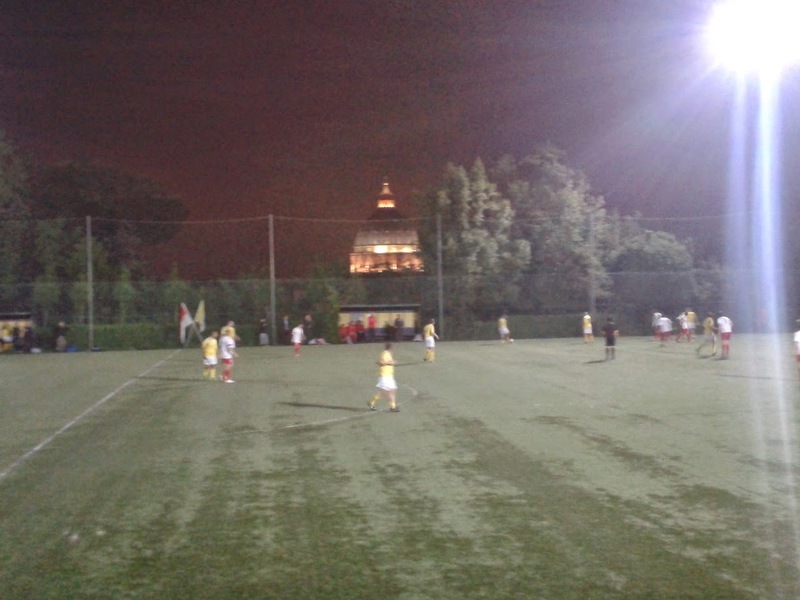 A beautifully clear evening in Rome, together with a view of the dome of St. Peter's Basilica, provided the perfect backdrop to an international match involving teams representing Europe's two smallest independent countries, the Vatican City and Monaco, at the Campo Cardinal F. Spellman on 10 May 2014. 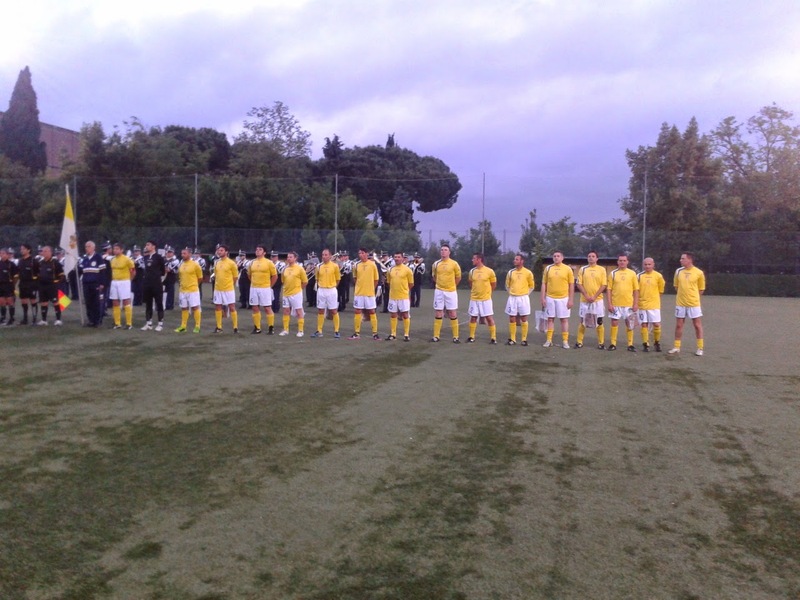 It was the Vatican side's first international match since they lost 2:1 to the Monégasques in June 2013; for the visitors, it was a chance to put a recent - horrendous - 10:0 defeat away to Ellan Vannin (Isle of Man) well and truly to bed. Monaco came with a slightly weakened squad, as a number of players selected for the trip to Rome had to cry off due to work issues. Considering the fact that the match had drawn a reasonable amount of media interest, it had drawn but a meagre crowd of spectators, almost outnumbered by journalists and dignitaries; in fact, the Vatican police band, who provided the pre-match entertainment and played both national anthems, probably outnumbered the huddle of people who gathered together to watch the match from the ground's one small stand. 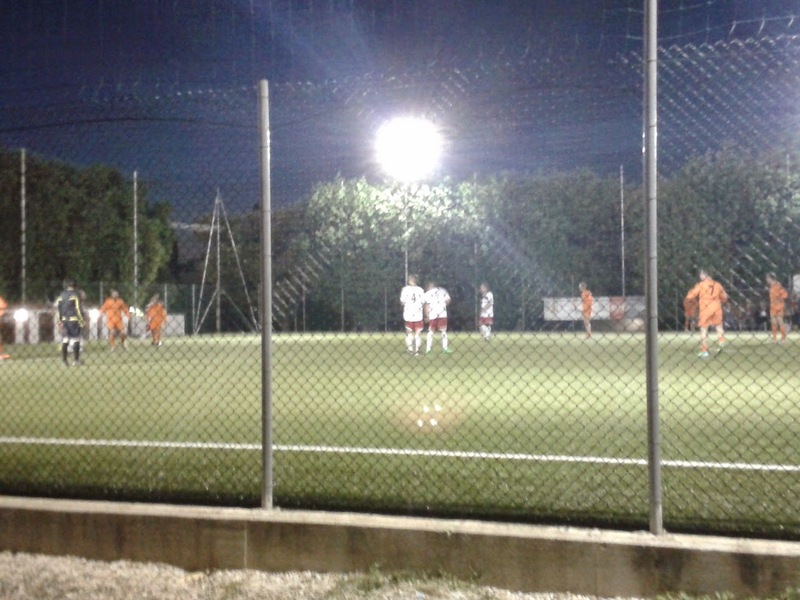 The Campo Cardinal F. Spellman is part of a larger sports complex, the Cavalieri di Colombo/Pio XI complex at the Oratorio di San Pietro, and was used until fairly recently by the Attività Calcistica Dipendenti Vaticani (Vatican FA) for league and cup matches when both competitions featured 11-a-side teams. 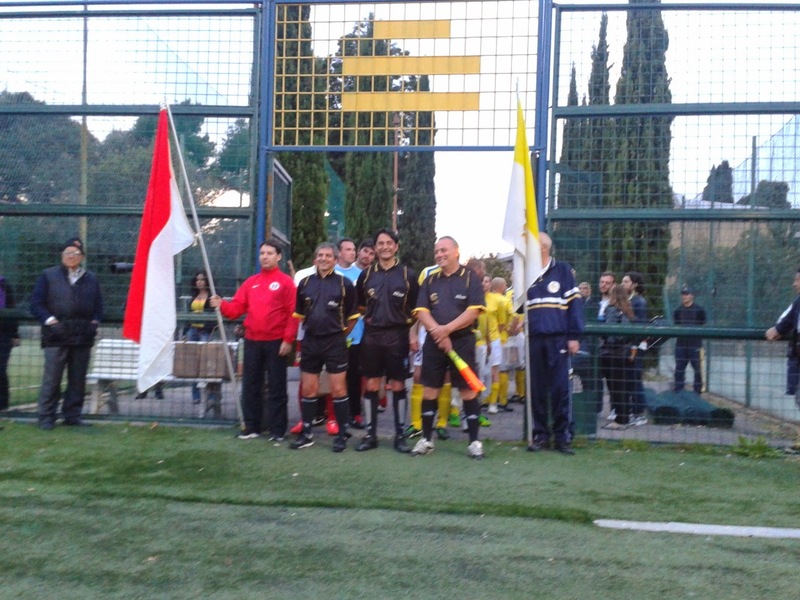 Once the formalities, including speeches from dignitaries representing both countries, had been dispensed with, the game could begin, albeit somewhat later than scheduled due to the match officials and a number of the Vatican squad being caught up in the traffic snarl-up in Rome, caused in no small part by an afternoon gathering of some 300000 Italian schoolchildren in and around the Vatican, which had been hosted by Pope Francis. And what a beginning to the game it was, with Monaco's Olivier Lechner opening the scoring within the first sixty seconds, catching the majority of those assembled, your correspondent included, off-guard with a shot which evaded Francesco Martella and flew into the bottom right-hand corner. Monaco dominated the early stages of the match, with Julien Sirio embarking on a mazy run down the left wing in the sixth minute; after beating four opponents, Sirio cut into the penalty-area and shot from 10 yards out, but Martella saved well with his legs. Another chance for the visitors saw the home 'keeper gather the ball with some comfort. The Vatican side were struggling to get their game together, but Andrea Majer did at least propel a shot towards the Monaco goal, only for it to be blocked by a defender. Another run down the left wing towards the Vatican, this time by Arnaud Sbarrato, saw him clear to the left of the home penalty-area, but he mis-controlled the ball, which was put behind for a corner by a stumbling Majer. Sbarrato had another chance a minute or so later, in the 26th minute, but, after a one-two involving Lechner, could only drag the ball wide of Martella's right-hand post. Not long after, Nasser Mboreha burst through the Vatican defence, but prodded the ball just a little too far ahead of himself, enabling Martella to get there first and smother the ball. Martella's feet got in the way of another effort from Sbarrato after 31 minutes, this time after the forward put the ball over a defender; from the corner, after a goal-bound shot was blocked, Sirio's shot from around the penalty-spot went with of the right-hand post. The home team were still unable to venture forward with any regularity, but Alessandro Quarta had the chance to put the Monaco defence to the test almost straight after Sirio's effort, but, in a chase for the ball from midfield with Jean-Paul Pennacino, only succeeded in fouling the central defender some 20 yards from the Monaco goal. A shot on anger was finally aimed in the general direction of visiting goalkeeper Fabrice Di Franco's goal after Sandro Traiani mis-kicked a corner from the left-hand side, but Fabio De Cesare, unmarked on the right-hand side of the Monaco penalty-area, could only fire over the crossbar. Still, this little flurry served to encourage the Vatican side, and a corner-kick on 36 minutes, which eluded everyone in the Monaco penalty-area, fell to Quarta on the right-hand extremity of the penalty-area, who could only stand and watch as his shot was well tipped over the bar by De Cesare. Back up the other end of the field the ball did go in rather prompt fashion, and Lechner almost profited from a weak back-pass from Maurizio Baroncini, but he shot straight at Martella. There had been one or two tackles during the first half which one could describe as being rather enthusiastic, and after another one had been pulled up by the referee just inside the Vatican half in the 43rd minute, Sirio earned himself the game's first yellow card, which was immediately followed by some "handbags" of a different kind - and which were also rather less stylish - than those normally associated with Rome. On to the second half, then, and not long after the restart, Di Franco in the Monaco goal went to head clear from the edge of the penalty area a rather aimless through ball, but completely misjudged his leap, the ball skimming off the top of his head; he was doubtless more than a little relieved to see it trundle past his left-hand post and behind for a corner. This was the start of a period during which the Vatican had much more of the possession, but were unable to fashion much that would concern the visitors' defence, apart from a shot from San Pietro's Chirieletti in the 54th minute which was well saved by Di Franco. In truth, it appeared as though both teams were starting to run out of steam, and this was reflected in the lack of efforts on goal, a couple of wayward shots excepted. It was hardly surprising that a number of the Vatican team were becoming fatigued, as they were on duty earlier in the day during the schoolchildrens' rally in central Rome. Monaco's Lechner, though, was showing no signs of fatigue, and was proving to be a source of worry for the home defence from time to time with his darting runs down the wing. Maximilian Agliardi with eight minutes left. In the 85th minute, Simone Palmieri skied a free-kick in a central position from some 25 yards out. 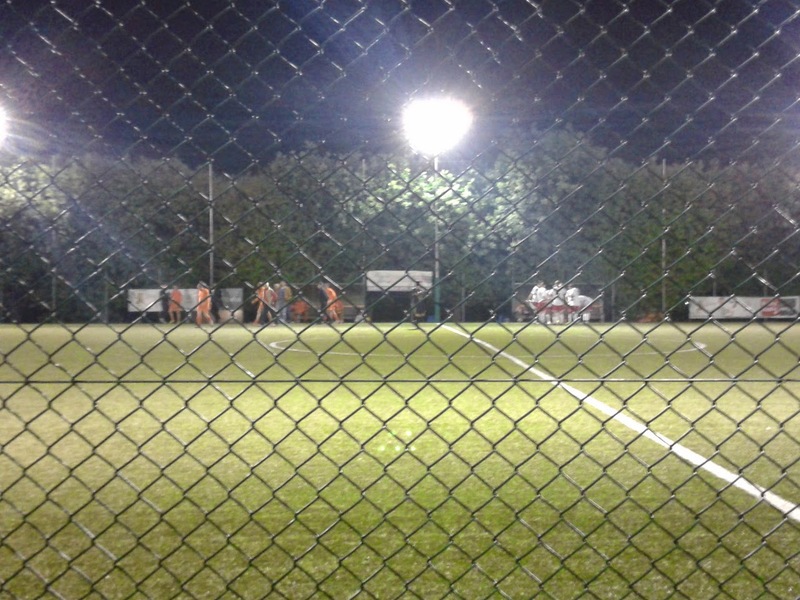 Less than a minute later, the ball had been worked upfield, and a cross from the left-hand side was controlled beautifully on the other side of the penalty-area by the unmarked Kevin Santini, who blasted the ball under the diving Martella from some nine yards out. The Vatican came forward in search of a consolation goal, though the closest they came was a cross-shot in the last minute of normal time from Chirieletti after his run down the left wing. Monaco ran out deserved winners of what was often a bitty - and occasionally fractious - ninety minutes of football, earning their third win in a row against their hosts and easing the pain of their 10:0 thrashing in the Isle of Man almost five weeks earlier. Olivier Lechner and Kevin Santini looked dangerous throughout for the visitors, and their defence looked solid for most of the ninety minutes. Goalkeeper Francesco Martella kept the Vatican eleven in the game right up to the very last minute of normal time, and was blameless for Monaco's second goal. Simone Palmieri was stoic in defence. Monaco's assistant manager Jean-Charles Arrigo declared himself satisfied with the result in what he described as a "close match, with two teams very close [to each other] in standard." The Vatican City team, meanwhile, can look forward to a friendly match next month against a team representing German side St.-Pauli. AUTHOR'S NOTE: Many thanks are due to the managerial staff of both teams for providing the squad lists for both teams, above all to Danilo Zennaro and Stefano from the Vatican City staff, Monaco's managerial duo of Thierry Petit and Jean-Charles Arrigo, and also to Aurelio Barbis for his tireless assistance and enthusiasm. There is a possibility that there may be some errors with regard to the Vatican City starting line-up; an attempt shall be made to verify the information provided above. Should the correct line-up not correspond with that stated in this article, the line-up shall be updated. 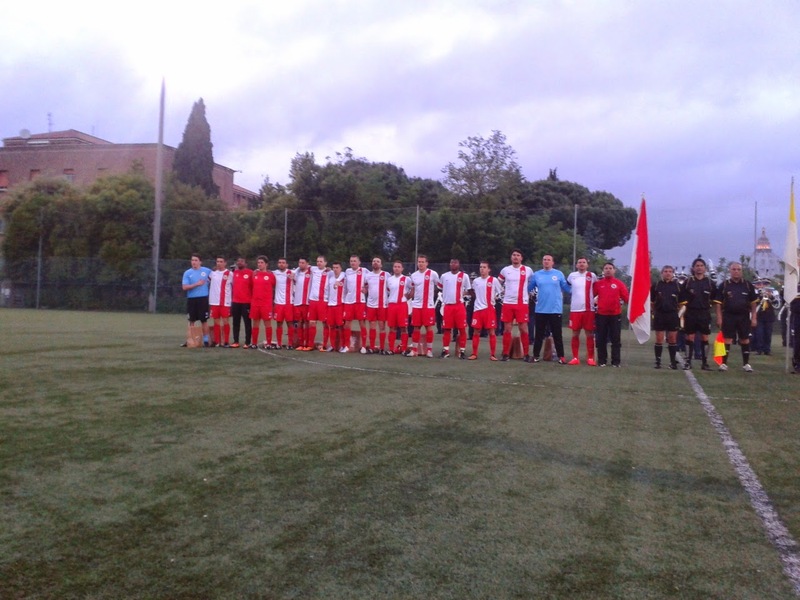 A double-header in the Maltese BOV Premier League was on the agenda on 1/2/14, but it wasn't that which was envisaged by yours truly before heading off to the tiny Meditteranean country. All will be revealed..
Saturday 1 February brought the promise of a double-header of matches in the BOV Premier League between Hibernians and Qormi, and Sliema Wanderers and Floriana, both of which were to take place at the Hibernians Stadium in Corradino. However, a tempest of almost Biblical proportions put paid to those plans, as torrential rain began overnight, and kept on coming - and kept on coming..and eventually waterlogged the grass pitch, ensuring that both games were called off. 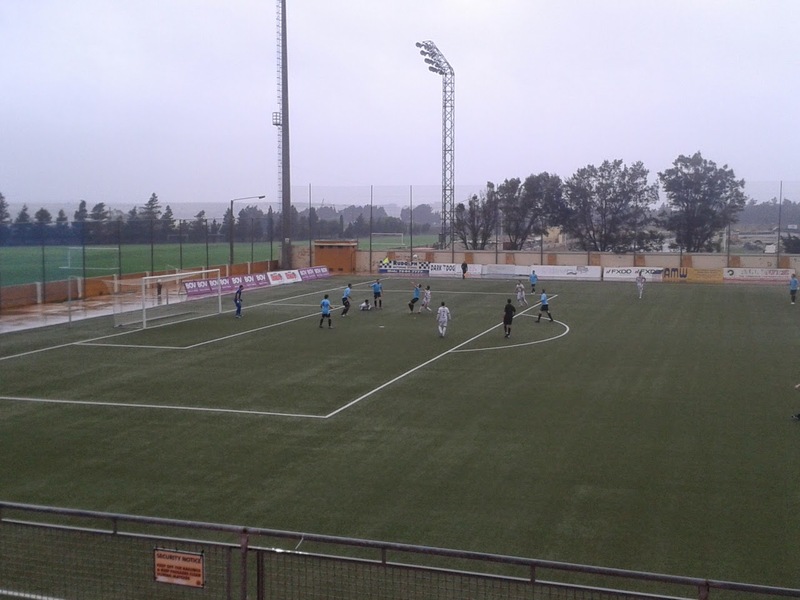 So, a helter-skelter dash across the island of Malta to the Centenary Stadium, Ta'Qali, ensued, where Balzan Youths were to take on Tarxien Rainbows in the late kick-off, with Rabat Ajax, who had only won one game all season, and Vittoriosa Stars first up in the "battle of the basement." More than an hour and three buses after leaving Corradino, your (by now) rather bedraggled correspondent arrived at the stadium just in time to hear a roar from the small contingent of Stars supporters just before half-time, Marcelo Pereira putting their favourites 1:0 up with a header in the 43rd minute. The second half began with the rain still teeming down and Rabat Ajax on the attack, and Mario Muscat in the Stars' goal did well to turn Diego Carrillo Pendas' free-kick around his right-hand post. Moments later, in the 54th minute, the Magpies almost took the lead when Joseph Caruana's shot, following a clearance from Pendas' corner, struck the outside of the Stars' right-hand post. In a period when attacking play from both sides was scarce to say the least, a Vittoriosa foray ended with Oscar Guerrero's shot flashing across Pavel Velimirovic's goal. The Magpies kept coming, though, and a virtually unchallenged Adam Smeir, not long after coming on as a substitute, headed just wide from eight yards out and Pendas' deflected shot was well saved by Muscat. Ajax were on top at this stage, but their goalkeeper, Pavle Velimirovic, underemployed as he was, stayed alert and saved Gilbert Martin's effort on 84 minutes, and then, at the second attempt, held on to Ousmane Sidibe's header from just a few yards out. As Rabat Ajax were pushing for an equaliser, their opponents were finding gaps in their defence, and Marcelo Pereira's shot was pushed behind by Velimirovic. In injury-time, Pereira should have put the result beyond doubt when put through for a one-on-one with the Montenegrin following a facile disposession of defender Ivan Carapic by one of three Stars' players, but Pereira's shot was blocked by Velimirovic's midriff and the ball went behind for a corner when it should have been lying in the back of the Rabat Ajax net. Still, Vittoriosa Stars did enough in the first half to ensure that the points were heading in the direction of the famous Three Cities, and Birgù in particular, though it was tough on Rabat Ajax, who deserved a share of the spoils after a determined showing in the second-half and remained nine points adrift at the bottom of the table. AUTHOR'S NOTE: The line-ups for the above game were not made available to your correspendent before or after the game in question, and the line-ups as listed above were taken from both The Malta Independent and the maltafootball.com website.